Marion and Tabitha Broderick's Fashionable Week! Home » Marion and Tabitha Broderick’s Fashionable Week! Holy cuteness Batman! Marion and Tabitha Broderick were the sweetest pair in New York City this week. The girls are ready for Spring to arrive and it showed by their bright outfits. Even though they are twins they don’t often completely match, but instead choose to compliment each other in pieces that look good together. This week we saw it all – matching, opposites and lots of coordinating styles. The week started in hot pink tights and matching jackets. Marion and Tabitha were beyond cute holding hands as they headed to school. On Tuesday both girls wore floral dresses while out with their nanny. 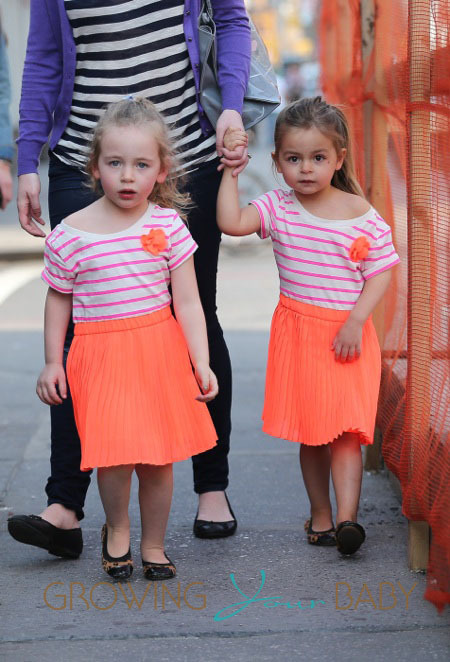 On Wednesday the little fashionistas matched in orange fluorescent skirts, pink stripes and black flats. Thursday the twins stepped out with their dad, Matthew. Marion was so cute in a pom pom headband. It must be her favorite because she also has one in yellow. 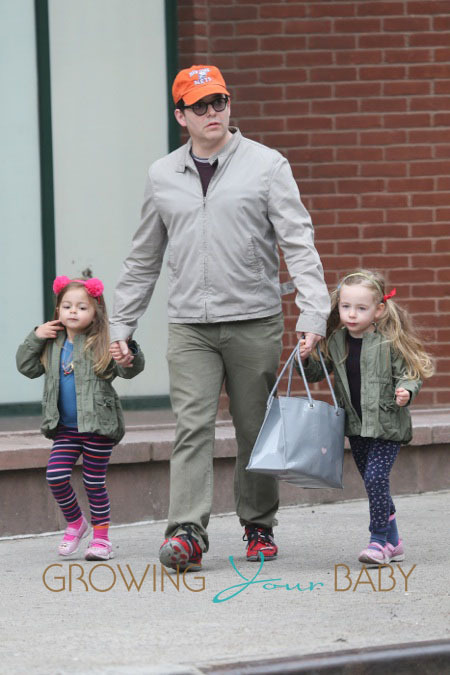 The girls wore their favorite green jackets and Paul Frank Mary Janes. Friday was mom Sarah Jessica Parker’s turn to do the school. Dressed for the rain, Marion and Tabitha one again matched in grey leggings and Paul Frank rain boots. Whew! These two are definitely taking after their mom. At some point they will likely need custom closets to hold their extensive collection of clothes, if they don’t have them already.